I measured the Liquid Platinum using a Clio 10 FW audio analyzer and a Neutrik NL-1 Minilyzer. Note that my focus with these tests is on measurements that confirm these devices’ basic functionality. Because I didn’t have the necessary four-pin XLR adapter that would allow me to measure the balanced output, the measurements below are all with the amp in single-ended mode (using the 1/4” TRS headphone output). I have the parts on order to build the adapter and hope to add those results later. Meanwhile, I was able to measure the frequency response of the HiFiMan HE6se headphones from the balanced and unbalanced outputs, and the results were identical. 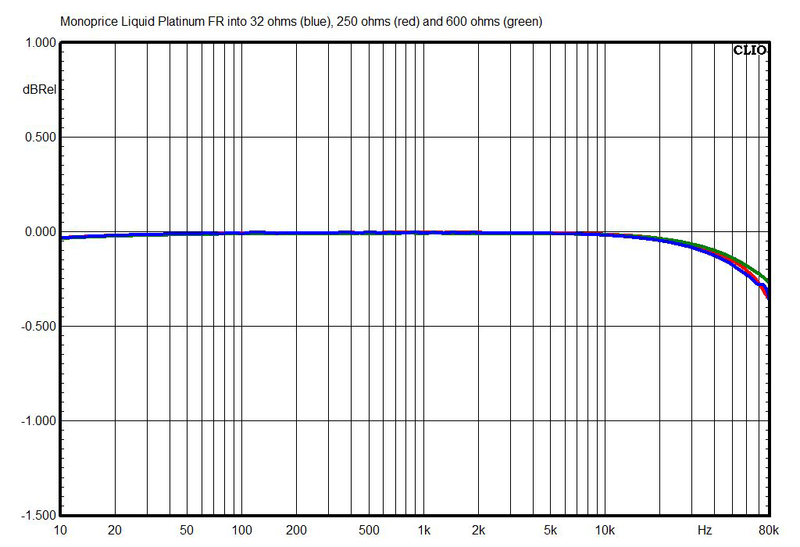 This chart shows the Liquid Platinum’s frequency response with 1mW output into 32-, 250-, and 600-ohm loads. Into 32 ohms, the response measures -0.014dB at 20Hz, -0.041dB at 20kHz, and -0.276dB at 75kHz. Into 250 ohms, the numbers are -0.015dB, -0.031dB, and -0.307dB, respectively. Into 600 ohms, the numbers are -0.015dB, -0.027dB, and -0.232dB, respectively. These are very good results. 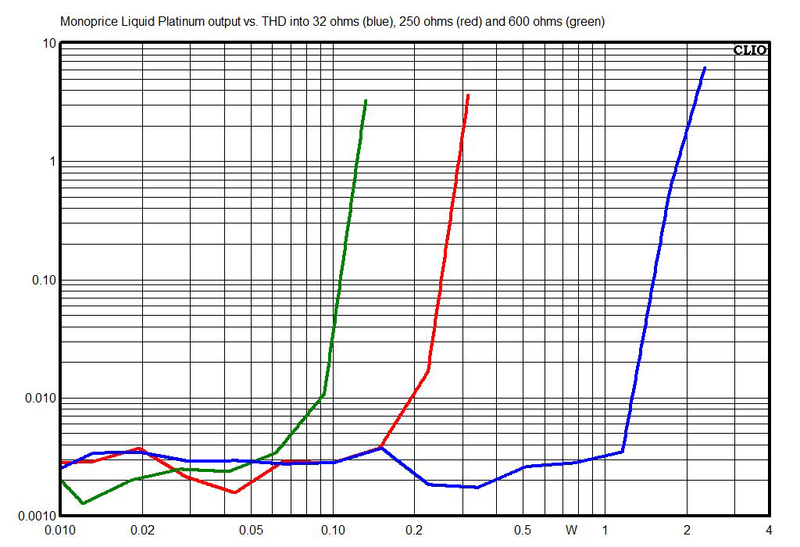 This chart shows the single-ended output of the Liquid Platinum vs. total harmonic distortion (THD) into 32-, 250-, and 600-ohm loads. Note that Monoprice’s power ratings are specified at 33, 56, 150, and 300 ohms, so my measurements are not directly comparable, but Monoprice’s specs seem well in line with my results. Output into 32 ohms is 1.71W at 0.5% THD and 1.85W at 1% THD. (Monoprice’s most comparable rating is 1.78W into 33 ohms, THD unspecified.) Output into 250 ohms is 275mW at 0.5% THD and 289mW at 1% THD. 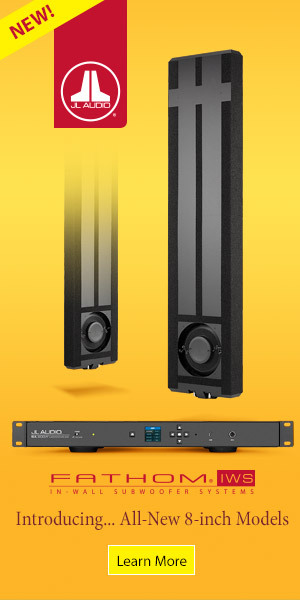 (Monoprice’s most comparable rating is 230mW into 300 ohms, THD unspecified.) Output into 600 ohms is 117mW at 0.5% THD and 122mW at 1% THD. 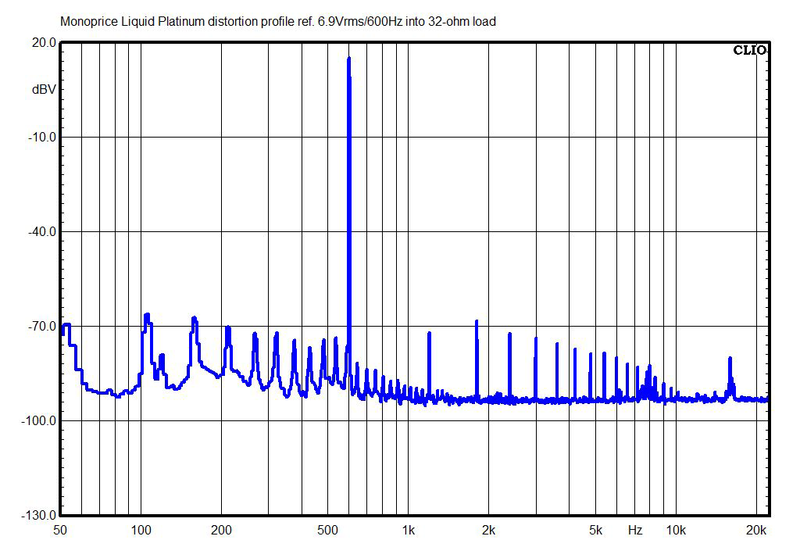 Here you can see the harmonic distortion spectrum and noise floor of the Liquid Platinum, referenced to 1.5Vrms (1W) output at 600Hz into 32 ohms. Distortion is low, and no particular distortion harmonic dominates the spectrum; the first several harmonics are down in the -72dBFS range (plus or minus a couple of dB) relative to the level of the fundamental tone. (For reference, -70dBFS equates to 0.03% harmonic distortion.) We can see some 60-cycle AC hum and its harmonics, typically in the range of -70dBFS. The noise floor of the amp at this level is down around -92dBFS, which is pretty good for a device with tubes in the signal chain. I measured output impedance of the 1/4” headphone jack at under 0.3 ohm at 1kHz, which is about as low as I can measure with my voltage divider; Monoprice rates it at 0.07 ohm. Either way, it’s easily low enough that the output impedance won’t react significantly with the reactance of the headphones, and thus won’t change their frequency response. I measured the Schiit Audio Fulla 2 using a Clio 10 FW audio analyzer and a Neutrik NL-1 Minilyzer. I used the Fulla 2’s analog input for all these measurements, because I haven’t yet found a way to get digital test signals from the Clio 10 FW to USB DACs. Note that my focus with these tests is on measurements that confirm these devices’ basic functionality. 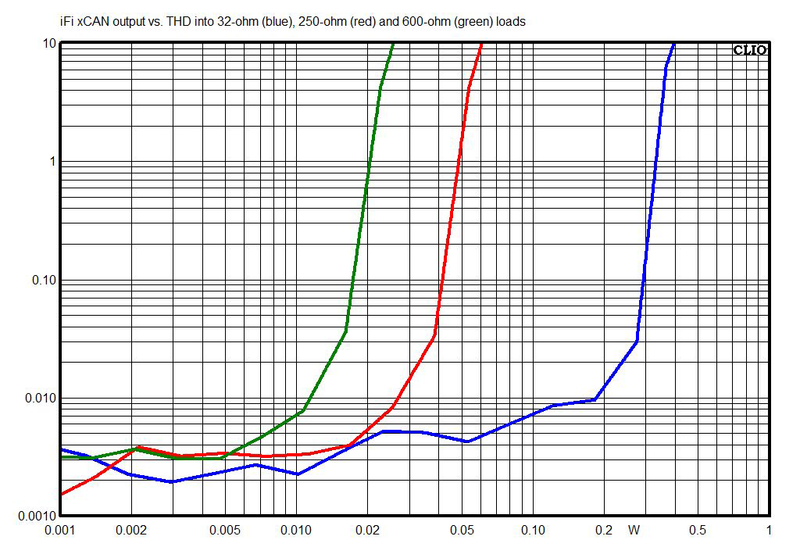 This chart shows the Fulla 2’s frequency response with 1mW output into 32-ohm and 600-ohm loads. (Frequency response at 250 ohms is not shown because it almost perfectly overlapped with the response at 32 ohms.) Into 32 ohms, the response measures -0.011dB at 20Hz, -0.031dB at 20kHz, and -0.085dB at 75kHz. Into 600 ohms, the numbers are -0.009dB, -0.044dB, and -0.186dB, respectively. 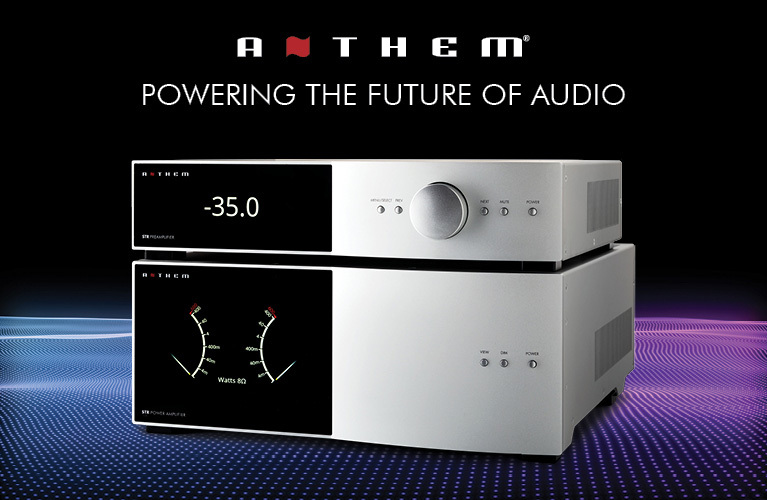 These are excellent results, comparable to those of a good high-end analog preamp. 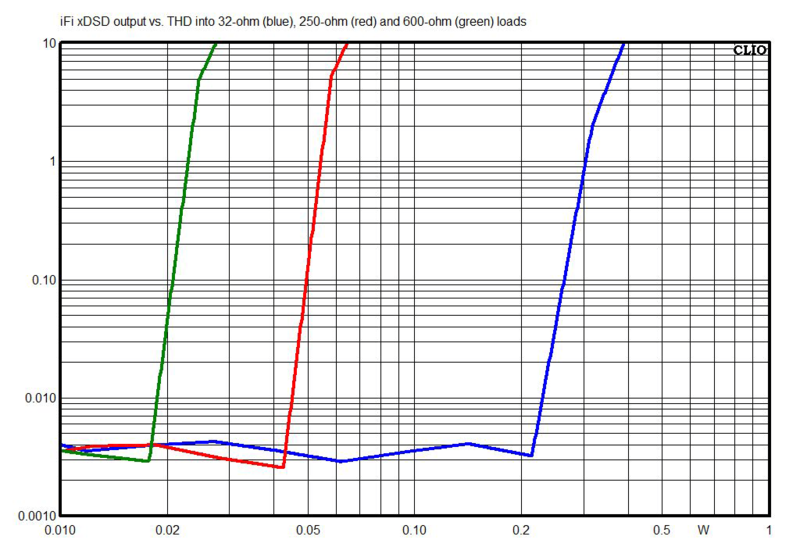 This chart shows the output of the Fulla 2 vs. total harmonic distortion (THD) into 32-, 250- and 600-ohm loads. Note that Schiit’s power ratings are specified at 16, 50, 300, and 600 ohms, so some of my measurements are not directly comparable. Output into 32 ohms is 320mW at 0.5% THD and 340mW at 1% THD (Schiit’s rating is 360mW into 32 ohms, THD unspecified). Output into 250 ohms is 50mW at 0.5% THD and 51mW at 1% THD. Output into 600 ohms is 21mW at 0.5% THD and 22mW at 1% THD. These numbers are all very impressive for a $99 DAC-headphone amp. 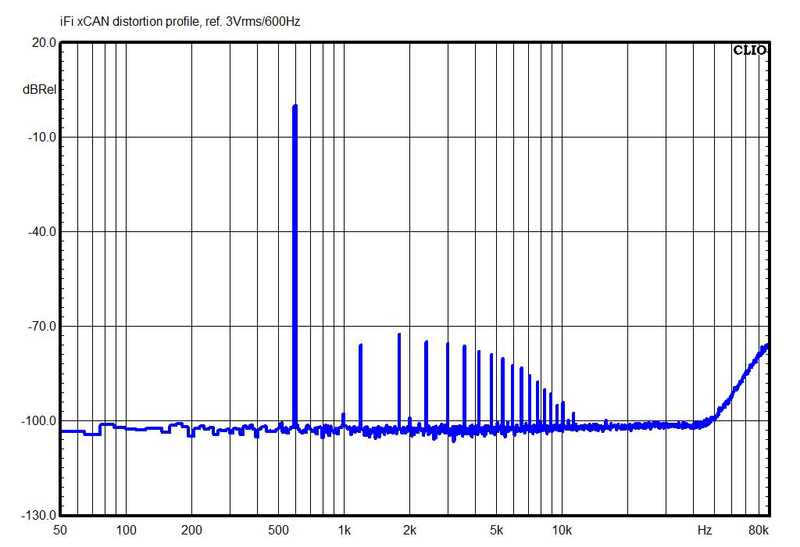 Here you can see the harmonic distortion spectrum and noise floor of the Fulla 2, referenced to 1V RMS output at 600Hz into 32 ohms. Distortion is very low, with the second harmonic slightly higher in level than the third; I’d say this would make the Fulla 2 sound “tubey” if the distortion at this output level and load were high enough for you to hear, but that second harmonic is at -79dB. You can also see that the noise floor of the amp is way down around -110dB. 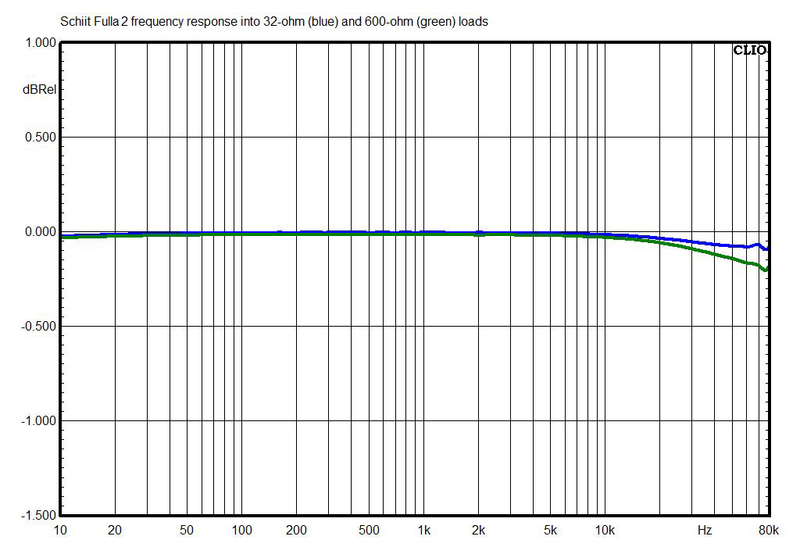 I measured output impedance of the headphone jack at 3.2 ohms at 1kHz; Schiit rates it at 0.5 ohm. Note that this measurement, made with a potentiometer used as a voltage divider, is not super-accurate, and any output impedance in the low single digits is low enough not to react significantly with the reactance of the headphones, and thus won’t change their frequency response. I measured the iFi Audio xCAN using a Clio 10 FW audio analyzer and a Neutrik NL-1 Minilyzer. Except as noted, I used the xCAN’s unbalanced analog input and unbalanced analog output, because I don’t yet have an adapter for 2.5mm balanced outputs I can use for measurements. Note that my focus with these tests is on measurements that confirm these devices’ basic functionality, and that gauge the efficacy of any special features and functions that might be measurable. 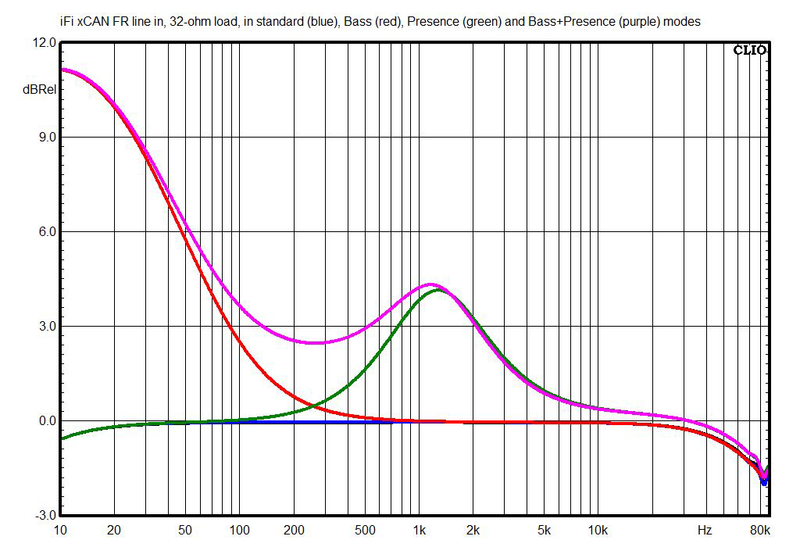 This chart shows the xCAN’s frequency response with all processing off, and with XBass II engaged in its three different modes (Bass, Presence, and Bass+Presence), with 1mW output into a 32-ohm load. With processing off, the response measures -0.14dB at 20Hz and -0.19dB at 20kHz. 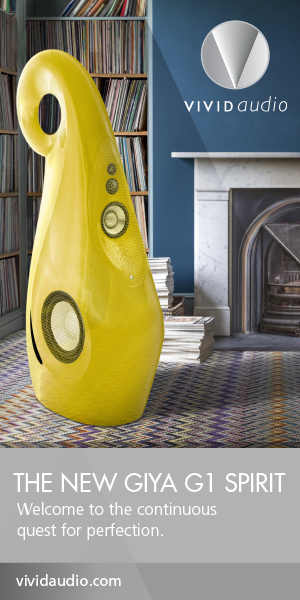 Bass mode boosts response by 9.96dB at 20Hz. 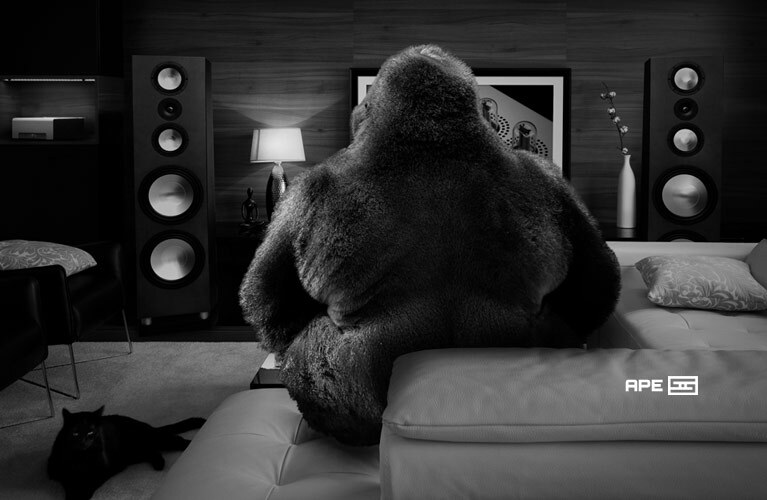 Presence mode boosts response in a 4.12dB peak centered at 1288Hz. Frequency response did not change in 3D+ mode, and also did not change with 250-ohm and 600-ohm loads. 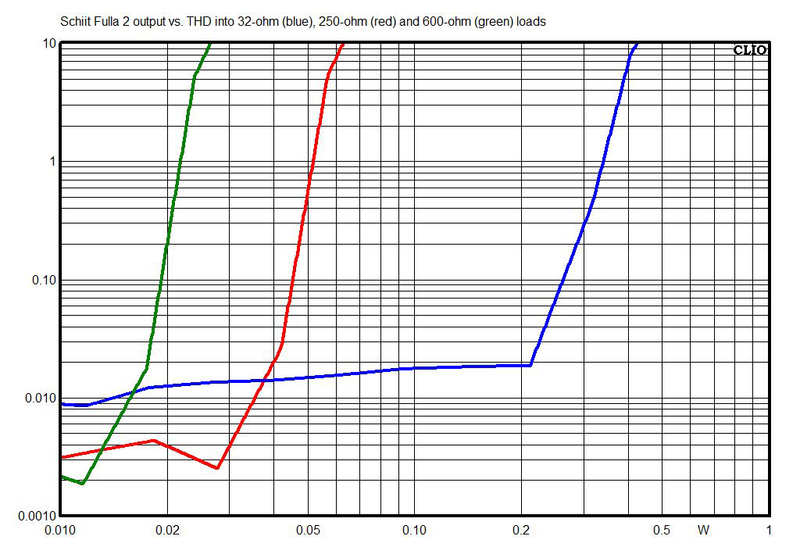 This chart shows the unbalanced output of the xCAN vs. total harmonic distortion (THD) into 32-, 250- and 600-ohm loads. Note that iFi’s power ratings are specified at 16, 50, 300 and 600 ohms, so some of my measurements are not directly comparable. Output into 32 ohms is 320mW at 0.5% THD and 336mW at 1% THD (iFi’s rating, in S-balanced/unbalanced mode, is 380mW into 32 ohms, THD unspecified). Output into 250 ohms is 46mW at 0.5% THD and 49mW at 1% THD. Output into 600 ohms is 20mW at 0.5% THD and 19mW at 1% THD. 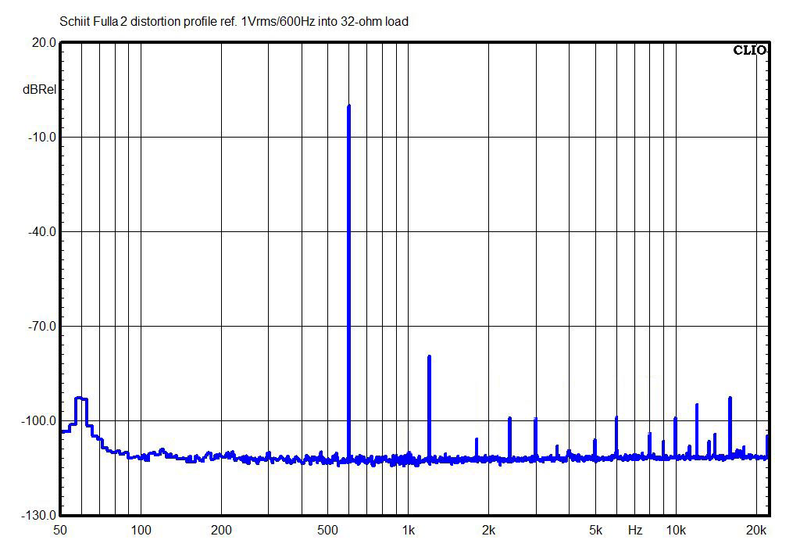 Here you can see the harmonic distortion spectrum and noise floor of the xCAN, referenced to 3Vrms output at 600Hz into 32 ohms. The third harmonic at 1.8kHz is slightly more predominant than the second harmonic, which will sound a little more objectionable than an amp (like a typical tube amp) with predominantly second-harmonic distortion, but if you actually dare to listen at 3Vrms (280mW into 32 ohms), the distortion from the headphones will likely be far louder than the distortion from the amp. I measured the unbalanced output impedance at 1.2 ohms at 1kHz; iFi rates impedance at <2 ohms for balanced and <1 ohm for unbalanced output. Regardless, the output impedance is low enough not to react significantly with the reactance of the headphones, and thus won’t change their frequency response. I measured the iFi Audio xDSD using a Clio 10 FW audio analyzer and a Neutrik NL-1 Minilyzer. For all of these tests, I used the xDSD’s coaxial digital input. Note that this is the first DAC-headphone amp I’ve measured for SoundStage! Solo; I’ve decided to focus my efforts on tests that confirm such devices’ basic functionality, and that gauge the efficacy of any special features and functions that might be measurable. 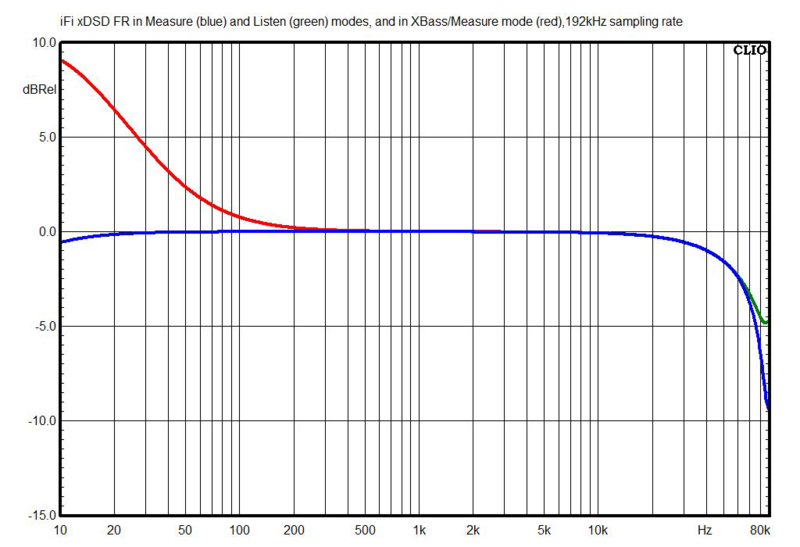 This chart shows the xDSD’s frequency response in its Listen and Measure modes, and with XBass+ engaged, with a 24-bit/192kHz S/PDIF signal and the xDSD set for 1mW output into a 32-ohm load. The response in both modes measured -0.16dB at 20Hz and -0.26dB at 20kHz. Listen mode actually measured slightly better here, with less rolloff above 65kHz; apparently, the switch is mislabeled. 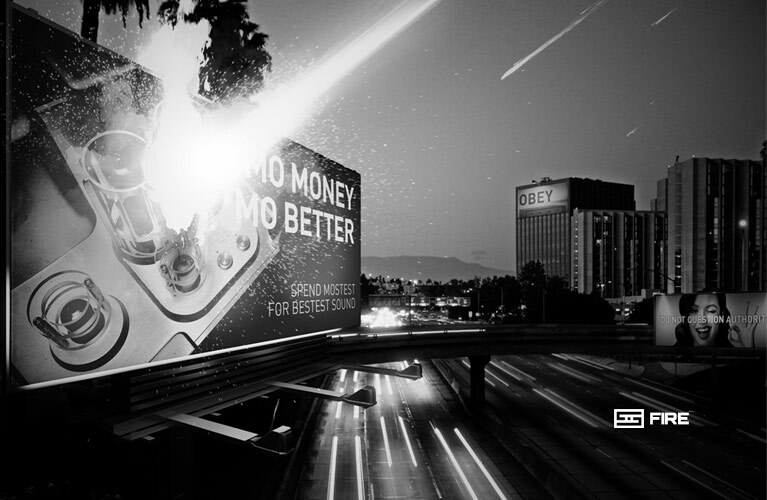 The bass boost in XBass+ mode was 6.48dB at 20Hz. This chart shows the output of the xDSD vs. its total harmonic distortion (THD) into loads of 32, 250, and 600 ohms. 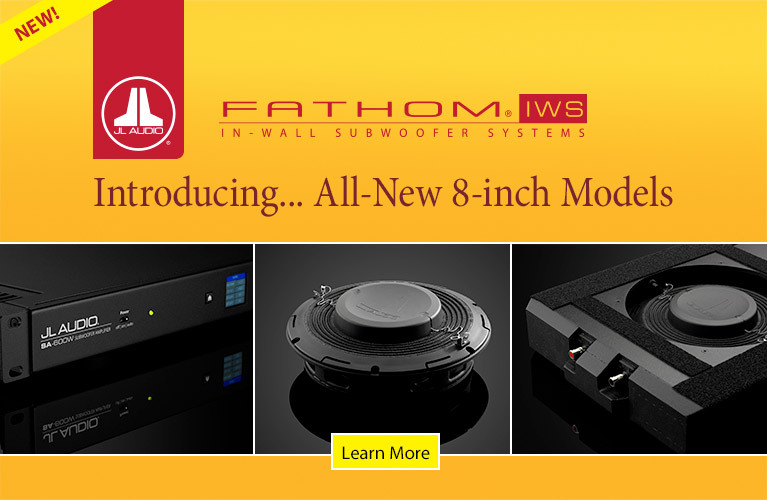 Although iFi specifies the xDSD’s power output into 16, 50, 300, and 600 ohms, which renders most of my measurements not directly comparable, those measurements do suggest that iFi’s specs are on the mark. The xDSD’s output into 32 ohms is 291mW at 0.5% THD and 304mW at 1% THD; into 250 ohms, the output is 53mW at 0.5% THD and 54mW at 1% THD; and into 600 ohms, the xDSD puts out 22mW at 0.5% THD and 23mW at 1% THD. 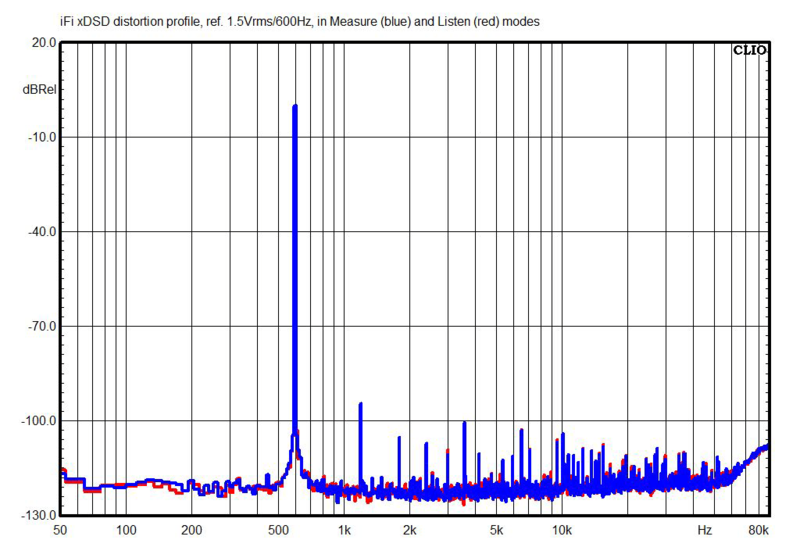 Here you can see the xDSD’s spectrum of harmonic distortion and noise floor when driven by a 24/192 S/PDIF signal and referenced to 1.5V RMS output at 600Hz. 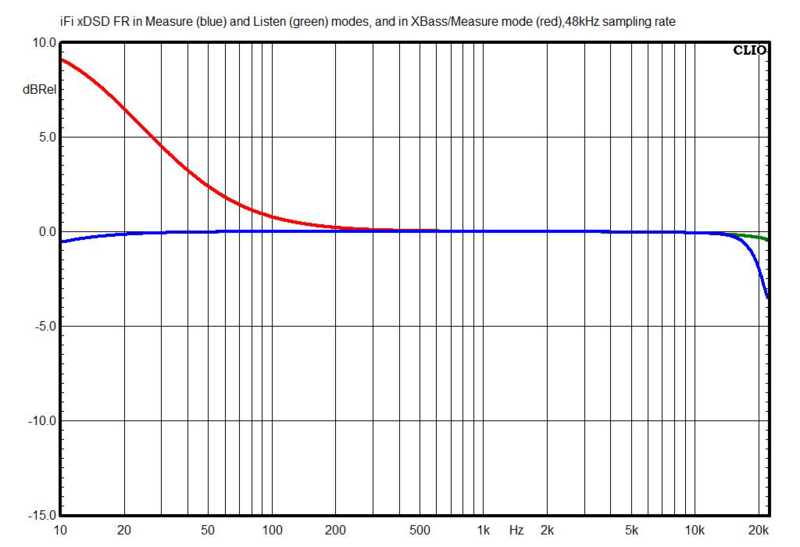 Note that the distortion profile of the Measure and Listen modes is effectively the same. I measured the xDSD’s output impedance as 0.8 ohm at 1kHz, which confirms iFi’s rating of <1 ohm. I prefer a headphone amp’s output impedance to be 1 ohm or less; the output impedance will then not react significantly with the reactance of the headphones, and thus won’t affect the ’phones’ frequency response.